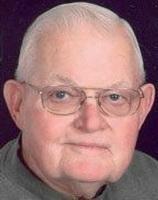 LA PORTE CITY — Don Dean Angel, 83, of Waukon, formerly of La Porte City, died Monday, Sept. 9, 2013, in Waukon following an accident. He was born June 23, 1930, in Dysart, son of John and Mabel Dorathea Stein Angel. He married Shirley Ruth Sides on Jan. 31, 1951, at the Methodist Church, La Porte City. She died in 2002. He married Audrey Grotegut on Oct. 23, 2004, at First Presbyterian Church, Waukon. He graduated from La Porte City High School in 1948, Gates Business College in Waterloo, and received a bachelor’s degree at State College of Iowa (now University of Northern Iowa), Cedar Falls. He taught in Brandon before moving to Waukon in 1962. While teaching, he earned his master’s degree from the University of Illinois, Champaign, Ill. He also was a driver’s education teacher and a coach for girls’ golf and basketball. He retired from teaching in 1992. Survived by his wife; two sons, Mick (Cathy) of Mount Vernon and Chad (Leah) of Waverly; a daughter, Linda (Mark) Hale of Stoughton, Wis.; a stepdaughter, Jane Grotegut of Waukon; 10 grandchildren; and 11 great-grandchildren. Preceded in death by his parents; and an infant brother, Dale. Memorial services: 11 a.m. Tuesday at First Presbyterian Church, with burial in Oakland Cemetery, both in Waukon. Visitation from 3 to 7 p.m. Monday at Martin Funeral Home, Waukon. Following visitation, the celebration of Don’s life will continue at the Waukon Golf and Country Club.